For several years back in the early 2000's, I had an original XBox that was modded so it could run XBMC (XBox Media Center). XBMC on the original XBox was awesome - it had a great user interface and would play every video file format known to man. But the original XBox wasn't high-def, so about 6 years ago I upgraded to a home theater PC built around an AMD Athlon 64 X2 5200 with a Radeon video card placed in an Antec NSK2480 HTPC case. Again, XBMC (on Windows) was my media player software and it has worked mostly great right up to now. I say "mostly" because XBMC has always been a little twitchy on this machine, requiring a restart every time the machine came out of sleep. But a small price to play for the amazing flexibility it offers. In addition to its size, the above three features were key to my decision to go with the Intel NUC. I looked briefly at a competing NUC unit from Gigabyte which includes Wi-Fi and Bluetooth for the same price as the Intel (you have to buy your own PCIe Wi-Fi card for the Intel if you want it), but foregoes an integrated IR port. I didn't need Wi-Fi or Bluetooth, and an outboard IR receiver is much less tidy. I'm also an Intel Ethernet bigot and the Gigabyte offering uses a Broadcom part instead, so the Intel NUC won out on several counts. I ordered the i3 version of the NUC from Newegg.ca, along with 4 GB of RAM and a 120 GB SSD. 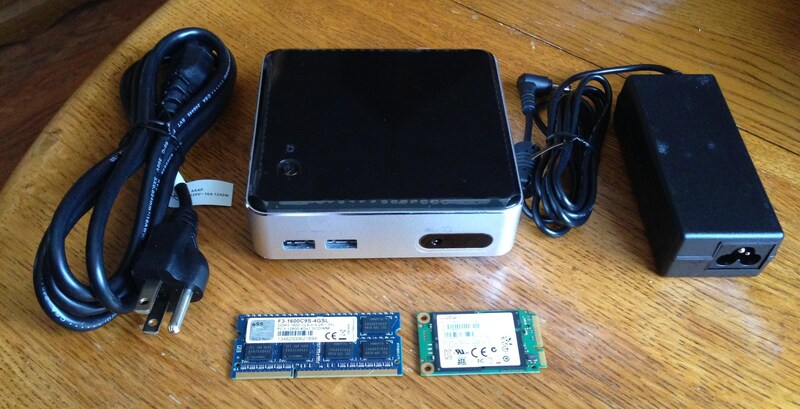 Note that the RAM is a 1.35 volt SO-DIMM and the SSD is an mSATA drive - be careful when ordering these parts as the NUC doesn't use standard desktop memory and you can't fit a regular 2.5 inch SSD in this case (though Intel now has a slightly larger NUC that will accommodate 2.5 inch drives). I usually order my parts from NCIX, but in a rare instance Newegg was actually cheaper this time around and had all the parts in stock. 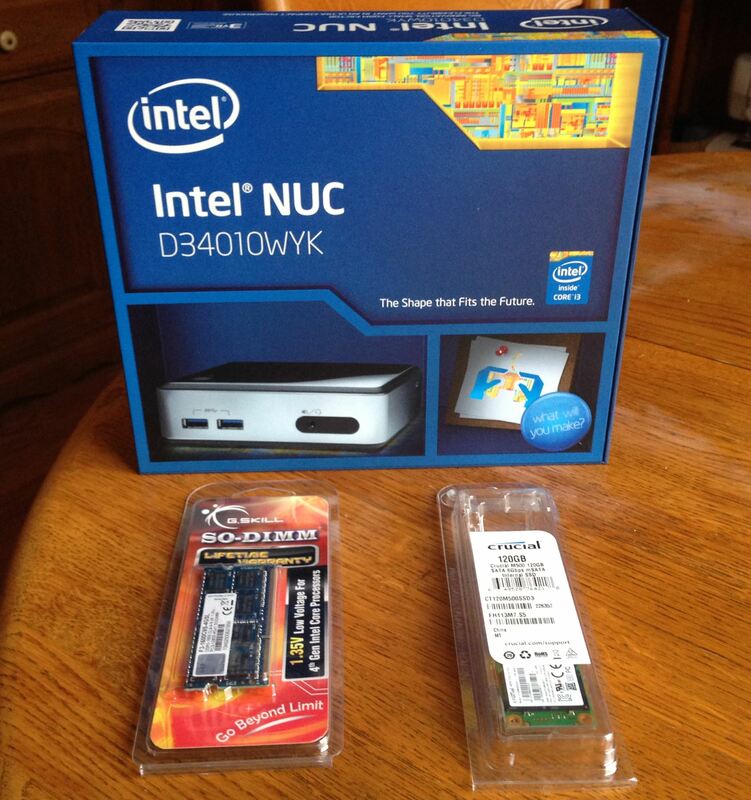 The NUC shipped from Canada, but the RAM and SSD shipped from the States. In a happy twist of fate, both shipments arrived on the same day (3 days after I ordered, and using ground shipping, too - kudus to Newegg on this one). I should also mention that I had ordered a mini-HDMI to HDMI cable from Amazon.ca a few weeks prior, since the Intel NUC doesn't have a standard HDMI port. One thing I found amusing about Intel's packaging for the NUC was the Intel jingle that played when I opened the box, much like those greeting cards that play a tune when you unfold them. The NUC was also much smaller than what I expected - only a little over 4 inches square, not much larger than Apple's current Apple TV box. I wasn't so impressed that I had to unscrew the four large Phillips foot-screws in order to install the RAM and SSD, but that was hardly a big deal. Once everything was installed and the NUC was reassembled, I was pleasantly surprised to see a nice GUI-based UEFI BIOS screen. It is very easy to use and I had the latest NUC BIOS upgraded in no time. I used Microsoft's Windows USB Boot Tool to put Windows 8.1 on a bootable USB flash drive and had it installed on the SSD in less than 15 minutes. Another plus for Intel was the fact that you can download the entire set of Windows drivers in one ZIP file - a nice time-saver. I'll say this for Windows 8.1 on Intel's i3-4010 and the Crucial SSD - the machine boots wicked-fast in less than 15 seconds! This is a welcome change from my old HTPC which took well over a minute to boot. I soon had XBMC installed and was ready for some testing. First, I wanted to check the power draw of this feisty little NUC. Man, this thing barely uses any juice. While playing a 1080P video file with DTS-HD Master Audio, it barely hits 15 watts. I measured idle power draw at around 9 watts, and it sips a measly 2 watts while in sleep mode. I was absolutely floored by these numbers. I also had some concerns that the integrated graphics in the Core i3 chip wouldn't be able to handle Blu-Ray quality 1080P video and high-def audio (I seriously considered spending an extra $100 for the i5 version of the NUC), but the machine barely breaks a sweat. Well under 20% CPU time while playing such a clip - amazing. The last thing to mention is the fan noise. This is the one quibble I have with the NUC as the fan is clearly audible even from several feet away. It isn't necessarily loud, but if you had to listen to it that close for an extended period of time I think it could get very annoying. Thankfully I sit about 12 feet away from it which makes it barely audible, and you certainly can't hear it when watching something. Even a whisper is enough to drown it out. Not directly related to the NUC itself but still pertinent to the HTPC experience as a whole is how I control the unit from way across the living room. I have a Logitech K400 wireless keyboard with an integrated track pad that works smashingly. But I hate to haul it out just to select a movie to play so instead I've programmed my Logitech Harmony Ultimate remote to work with Windows 8 and XBMC. It works really well, especially after making a few tweaks to the remote configuration to add some important functions. I'll write about those in a separate post. Overall, I am immensely pleased with the Intel Haswell NUC. It's blazingly fast, amazingly energy-efficient, performs magnificently, and is nice and tiny. In fact, this would make a great general-purpose PC for anyone who didn't need an optical drive or required any expansion room. And while Intel's integrated graphics have come a long way and are well-suited for video tasks like this, their performance in today's top-tier games is underwhelming so gamers should look elsewhere. For an HTPC it's a tad pricey, true, but its tiny footprint makes it incredibly flexible. It even comes with a VESA mounting plate to attach it to the back of a monitor for a truly out of sight configuration. All in all, this is a great little device and I expect it will serve my HTPC needs for years to come. Highly recommended. A few months ago I decided to retire my 4-year-old i7-860 PC and build a new machine based on Intel's Haswell platform. I had skipped Intel's previous Sandy- and Ivy-Bridge systems and was looking forward to modernizing my ageing PC, not only with a new, power-efficient Core i7 processor, but also with chipset improvements such as USB 3 and SATA III (and because of the motherboard I selected, Thunderbolt). 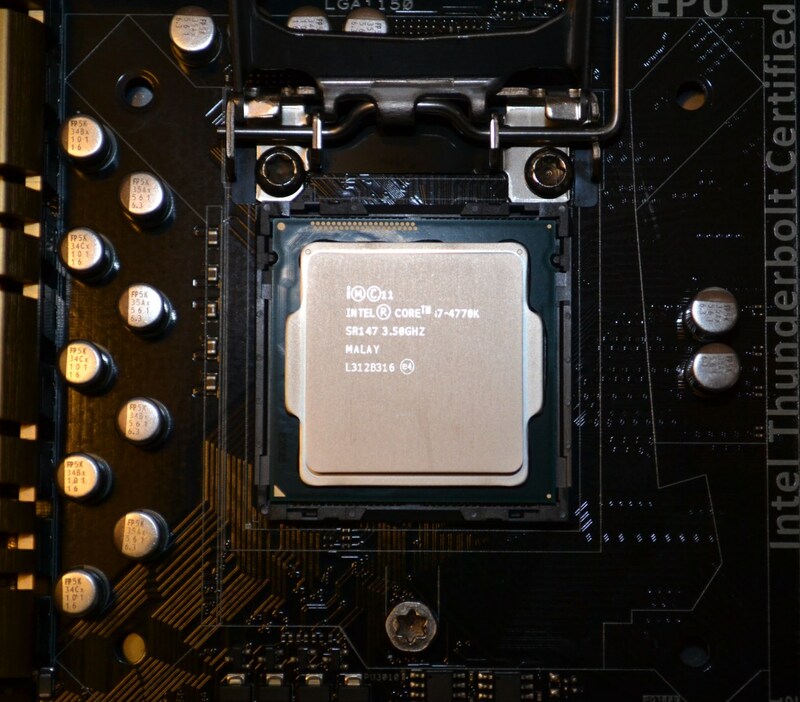 Like the i7-860 system before it, my new Z87/4700K system is rock-solid reliable. No weird BSODs or driver issues to deal with - everything just works. This is a relief, since 20 years of custom PC builds have taught me that you never know what to expect when assembling your own system. But with each iteration, PC components and drivers have thankfully gotten more trustworthy. And more efficient. The i7-860 system idled at about 140 watts while the new i7-4770K build runs 110 watts at idle. I can't say, however, that this new i7-4770K system feels significantly faster than the i7-860 it replaced. Oh, the benchmarks might tell you it is, but I find it hard to notice mostly because, as I've stated in the past, I don't do a lot of PC gaming and this is used primarily for general purpose PC tasks like web browsing. However, being an enthusiast means I'm not content with merely good enough hardware and I'm compelled to build high-performance machines. The Sapphire Radeon dual-fan cooling solution is remarkably quiet. Fire up a modern first-person shooter game (like Tomb Raider), however, and you'll have no trouble hearing it anymore. Every fan in the system steps it up a few notches to provide adequate cooling to the CPU and GPU. I wouldn't exactly call it noisy at this point, but you can definitely hear it. The last thing I wanted to make note of is the NFC reader that Asus bundles with the Z87 Deluxe/Dual board. In order to justify the higher cost of this particular motherboard, Asus had to add something. Frequently, these "value-add" items are gimmicky and while they may sound cool, they are of little real-world use. For me, however, the NFC reader is extremely useful. It provides two very welcomed features: the ability to log into my computer without typing a password, and a two-port USB 3 hub. The USB hub is self-explanatory, but not many people are aware of NFC (near-field communication) as it is primarily a smart-phone technology that hasn't really caught hold yet. In this case, it allows me to place a small NFC tag (included with the Deluxe/Dual, or you can use your phone if it supports NFC) on the NFC reader which then auto-logs me into my machine. Anything that keeps my computer secure without requiring me to type passwords all the time gets high marks in my book. I recently upgraded my cell phone from an iPhone 3GS to an iPhone 5. I had REALLY wanted to get a Windows Phone 8 device, but the killer feature for me was iPod integration in my car, and my car doesn't support streaming over Bluetooth. I have an AUX jack, but that just seems so primitive. So I was "stuck" with the good ol' iPhone. In addition to the immediate global availability of iOS updates, I have to give Apple credit for still supporting iPhones as far back as the 3GS. Sure, it doesn't have all the latest features (like Siri) but they're still supporting their loyal customers with older devices. Kudos. Another reason that Apple has kept me as a customer is the fact that I can buy a phone directly from them, unlocked. Buying any other manufacturer's phone in an unlocked state is not often straight-forward. I can't buy a Lumia 920 directly from Nokia. I can't buy an HTC 8x from HTC. I can't even buy a Galaxy SIII from Samsung. Though there are some vendors who sell these items unlocked, they are not major retailers and I don't know whether to trust them or not. One more thing that Apple has in their favour is the available AppleCare+ warranty and insurance for the iPhone. I never buy extended warranties for anything but I paid an extra $100 for this. Why? It's not so much the additional one-year warranty (for a total of two years) but rather the "accidental damage" insurance. If I drop my iPhone and break the glass, for example, I pay Apple $49 and they give me a brand new iPhone. I can do that twice within the two-year AppleCare+ coverage period. I don't know of any other smart phone that offers that optional coverage. So, yes, I'm "stuck" with the iPhone. I really prefer the Windows Phone 8 operating system and I would like a bigger screen, too. But, it turns out being stuck in the iPhone world isn't so bad after all, and I haven't even mentioned the ubiquity of iOS apps. I guess I can be satisfied with my situation, for now. Generally speaking, desktop computer power supply units (PSU) aren't very exciting. You plug them into the wall, flip the switch, and your computer turns on. There just isn't much more to them. Or is there? It may come as a surprise to some that since a computer runs on electricity, the unit that provides that electricity is one of the most important components in the computer system. Poorly designed and/or cheaply manufactured PSUs are the cause of many issues with modern computers, including sudden system crashes, data corruption, and display glitches. Naturally, a more demanding and higher performing computer is more susceptible to the imperfections of a less-than-adequate PSU. In addition, power efficiency has in recent years become more and more important and PSU manufacturers now proudly display the efficiency rating of their products. The fact of the matter is that if your computer is experiencing any sort of random malfunction, the PSU becomes a prime suspect. And so it was with the last PSU I had purchased, a Corsair HX620w. While highly rated and with many satisfied customers, my particular unit suffered from an affliction that resulted in my hard drive periodically refusing to operate properly. Instead it would just sit there, clicking away whenever data was requested. I returned several hard drives believing that I had been astonishingly unlucky by receiving several bad units. I finally moved the drive to a different power connector on my Corsair and it worked fine ever since. But my trust in that PSU was shattered and when it came time to look for a new one I turned my eyes to the legendary Seasonic. Most PSU "manufacturers" actually outsource the actual production of their units. Seasonic builds its own and their PSUs are regularly very well reviewed by those with fancy load-testing equipment that can observe even the smallest voltage fluctuation and the most minor of current ripples. So, after several months of intermittent research, I decided my next PSU would be a Seasonic. I eventually settled on the Platinum 860 for two reasons: it is utterly silent at up to 40% load, and it is the most efficient PSU money can buy (at the time of this writing, anyway). Of course, I also wanted my new PSU to be modular, meaning that there are no cables "hard-wired" into the unit. This results in less clutter inside in the computer case since you only include those power cables that you absolutely require. The actually wattage of the PSU was the least important factor in my decision. While many PSUs are approaching and even surpassing the 1000w mark, many tests have shown that even a demanding CrossFire or SLI system with two power-hungry video cards rarely needs more than 600 watts of power. But the lowest available wattage for Seasonic's "Platinum" efficiency series is 860 watts, so that's what I bought. Now, let's be clear. This is way more PSU than I, or just about anyone else, needs. But there's something to be said for buying and working with a finely engineered piece of equipment. I believe this is one reason that Apple is so successful with its products. In fact, I was so pumped when it was delivered to my house, I performed the much revered "Japanese Unboxing Ceremony" (well, that's what I call it, anyway) on it. And, indeed, much thought and care has been taken in the packaging of this unit (see the picture gallery below). I especially liked the velvet pouch that the actual PSU was enclosed in, and the two-pocket vinyl bag for storing unused power cables. Also included were several zip-ties and velcro cable organizers. Installation was simple and straightforward, and I had no problems with the length of the supplied power cables in my Antec P280XL, though one or two of them didn't have much slack left when I was done. Turning the unit on for the first time was somewhat interesting because, as I mentioned earlier, it is completely silent. In its "Hybrid" mode, the cooling fan doesn't even come on until the PSU reaches 40% load. And since I rarely play demanding games on my rig which would cause the graphics card to demand much more power, it's likely that I'll never hear the fan at all! It's also worth mentioning that other reviewers have stated that the Platinum series from Seasonic also has little to no "electronic" humming. Even with the fan off, the circuitry inside a PSU can still buzz annoyingly, but I haven't heard any noise whatsoever from this unit. Performance-wise, well, what can I say? As one would expect, it powers my modest system just fine. I haven't experienced any random glitchiness or hard drive power hiccups like I did with the HX620. So I'm satisfied with it, but I recommend you seek out the super-geek sites that really put these PSUs through their paces, and measure every flutter and waver in the 12v and 5v power rails. The Seasonic Platinum 860w commands a premium price for performance that few truly need, but its build quality and attention to detail make it a solid foundation upon which to build any system. And you'll feel good knowing that you've bought some very solid kit. I make my living writing computer software, but computer hardware is actually my first love. I LOVE HARDWARE! Motherboards, CPUs, video cards and hard drives. Nothing gets me quite as giddy as when the UPS man delivers a package from my favorite on-line computer store. And so it was last week that I received TWO packages - an Antec P280 chassis and a Seasonic Platinum 860W power supply (PSU). I've been using an Antec P180 (the original Performance One model) chassis since just about the time they first came out. I can't be certain, but something tells me that was in 2005. Seven years is a long time to hang on to the same computer chassis, but the P180 was such a stellar performer that there never really was any reason to replace it. For about the same amount of time, I've also had a Corsair HX620W modular PSU. The Corsair may have worked fine for a year or two, I'm not sure, but I returned several new hard drives that had the "click of death" before I realized that my PSU was the real culprit. I was able to keep limping along with the Corsair fine for the most part, moving my hard drive to a different modular connector, but I was still plagued with flickering white levels on my monitors. I originally blamed my Radeon 5870 for this before once again pointing the finger at the Corsair. I decided that I wanted to wait and get both a new chassis and new PSU at the same time. (Actually, I was waiting to get a whole new Ivy Bridge system but decided to get the chassis and PSU now.) But there really wasn't anything compelling in the chassis department. I could have moved to Antec's P183, but it was so close in design to the P180 that it didn't seem like a worthwhile upgrade. Silverstone has their FT02 which is a VERY nice, elegant design but is quite a bit larger than the Antec cases, and also significantly more expensive. I was also impressed by Fractal's Define R3 chassis, but at the time it lacked USB 3.0 ports and there was some concern over fan noise. So I waited and waited. And then finally, the P280 was announced late last year and I knew it was my next chassis. Still very similar in design to the original P180 including the "270-degree" fold-back front door, but now with front USB 3.0 ports which have also been moved to the top of the case where they are much more convenient. Also more convenient are the power and reset buttons on the top, no longer requiring me to open the front door where they are hidden away half-way down on the P180. Minor enhancements to be sure, but welcomed. Of far greater note are the superior cable routing capability, much quieter fans, and generally improved cooling performance (see below - CPU and GPU temps are 2 to 4 degrees better, while the motherboard and hard drive temps edge a little higher). Working inside the P280 is an absolute delight. Gone from P180 is the separate "power supply zone" baffle and the interior is now wide open. Add to that the cable routing ability behind the motherboard (which has become a standard feature these days) and you have an environment that is no longer cramped and confined, but rather one that is open, clean, and organized. Here is a look at the insides of my P180 compared to the P280. Note that in the P180 I had moved my hard drive to a rather sloppy, unsecured position just sitting on the PSU zone divider. This was a "frustration" move to get the drive closer to a different power connector, since sharing one with my SSD drive in the bottom drive cage was causing the "click of death" I mentioned above. But even without the hard drive, you can see the mess of cables everywhere and how difficult it is to route cables, especially from the PSU to various points on the motherboard, graphics card, and drives. A look at the insides transplanted to the P280 is comparitively-speaking a work of art! Everything is neat and tidy, greatly improving air-flow and making maintenance a breeze, too. Other ease-of-use changes in the P280 include the tool-less install of 5.25" drives, like my LG Blu-Ray writer. Just slide the drive in and it locks in place via a cantilevered plastic locking tab. I further secured it with a couple of screws, but you can only do that on the right side - there are no screw holes on the left side. Still, with the two right-side screws, it's secured in there pretty solid. One screw secures my 2.5" SSD in the top 2.5" drive cage (there's room for one more) and my 1.5TB hard drive is secured via four screws to a platic caddy (with silcone grommets for vibration isolation) that slides into the main drive cage. Of course, the PSU is on the bottom of the chassis, in the same place as the P180 but without any separating baffle this time. There's also a vent right below the power supply to aid with PSU cooling. 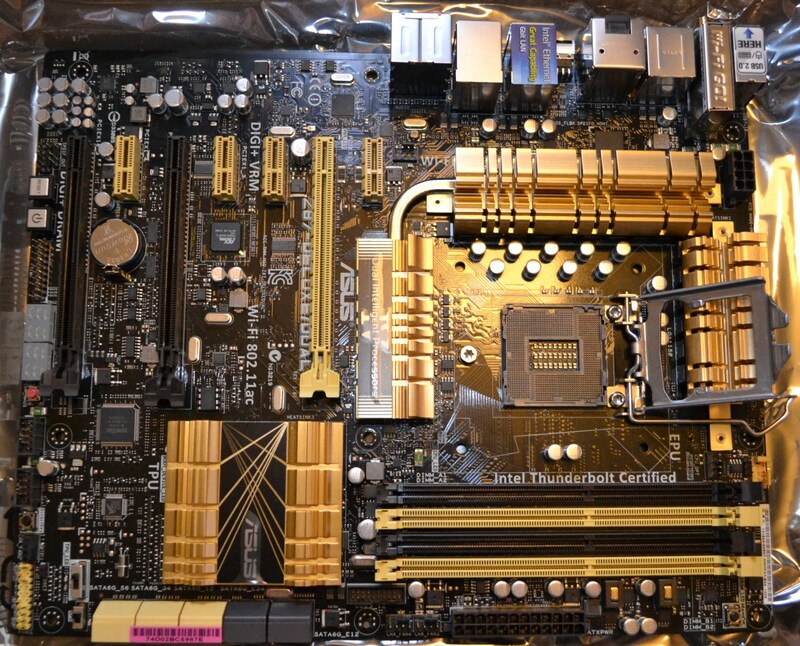 Also of note is the use of thumb screws for both side panels, and the expansion (PCI) slot covers. Chassis cooling is provided via three 120mm Antec "TwoCool" fans - 2 on top and one on the back. The speed of each fan can be adjusted individually via switches on the back of the case. There is a low and high speed setting, and I have mine set on low. The fans are significantly less noisy than the P180's three "Tri-Cool" fans which I had all set on "Medium". I also had a 120mm orange Nexus fan on the front of my P180 to draw air in. Though you can mount up to two 120mm fans on the front of the P280 and/or another two 120mm fans on the other side of the main drive cage, I find that the provided fans offer the same cooling power as my P180 - but with one less fan and much less noise. In fact, the unit is all but silent from my sitting position about three feet away. There is still an intermittent resonant hum from the case which I expect will prove little problem to eliminate once I get the chance to spend a little time tracking it down. The P280 is substantially less heavy than the P180 "beast" that it is replacing (the P180 was 14kg while the P280 weighs in at only 10.2kg), it doesn't really feel less sturdy. The P280 is ever-so-slightly larger, too, but not enough to make a fuss about. It's worth the extra room for the cable routing ability. However, I do miss the "DeLorean" look of the aluminum side panels on my P180 (see image gallery below) but I suppose there's nothing wrong with flat black. 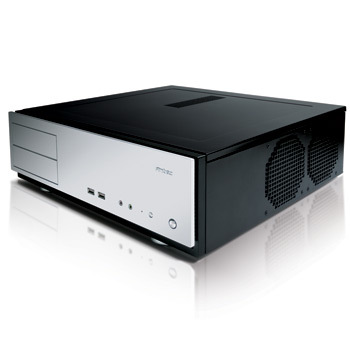 Overall, I am very satisfied with the Antec P280 and I look forward to owning it for another seven years. Highly recommended.